Born on November 8, 1952, in Fall River, Massachusetts, Jerry Remy was not yet the leader of Red Sox nation nor the "Rem Dawg", he was just a regular kid that loved the Red Sox and Pete Rose. Life in Fall River didn't last for long as the family moved to Somerset Massachusetts which is where Jerry spent most of his youth. How does a person go from becoming an excellent high school athlete to the pros, and then a New England icon? 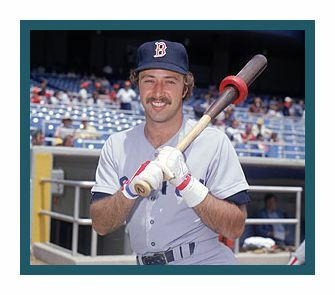 Jerry Remy's baseball career started as far away from Fenway Park as baseball in America can take you, California. After being drafted in the 19th round of the 1970 amateur draft by the Washington Senators only to not sign, Remy was again selected in the 8th round of the 1971 draft by the California Angels. Remy's minor league career was brief but successful. Before making the jump from double-A to the Major Leagues in 1975, Remy won a batting title for El Paso in the Texas League in 1974 hitting .338 before being called up to triple-A Salt Lake City. In forty-eight games in Salt Lake, Remy hit .292 where a gentleman, unbeknown to Remy as an Angels' bench coach told him, "If you come to spring training and play like you have been this year, you've got a good chance of making the team." And after spending the offseason in Mexico Remy did just that hitting .313 in the spring of 1975 not only making the team, but taking the starting second base job from veteran Denny Doyle. Remy played for three seasons in California where in his third season at the ripe age of 24 years old he was named the team captain by Angels manager Norm Sherry. Remy would play 444 games in California hitting .258 with five of his seven career home runs, an on base percentage (.315) only four points higher than his slugging percentage (.319) and 110 stolen bases ranking him 9th on the Angels all time list. 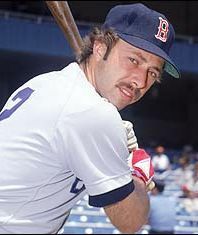 Jerry Remy's first major league hit came on 4/7/1975 against the Kansas City Royals. And if you've heard Remy tell the story during broadcasts over the years, you know how the story ends; so excited with his achievement, Remy was promptly picked off base. Remy's time in California ended when he was traded back home to the Red Sox for pitcher Don Aase and cash. Ironically enough, Remy's time in Boston started the same way it did in California; by replacing incumbent second baseman Denny Doyle. In 1978, his first season in front of his home town fans, Remy had the best of his career batting .278, scoring 87 runs and stealing 30 bases. His performance earned him a spot on the 1978 American League All-Star team. The '78 season would go down in Red Sox lore ending in the infamous "Bucky Dent" one game playoff against the Yankees on October 2nd. Remy would call it "one of the greatest games in the history of baseball." He would go on to say that it was a "perfect game, except we lost." Remy would go 2-4 with a double and a run scored. Both of Remy's hits that day would come off of Yankee closer Rich "Goose" Gossage. In the bottom of the eighth inning, just moments after the anguish of Bucky Dent's three run home run to put the Yankees ahead 5-2, Remy lead off with a double and scored. The Red Sox would add another run to cut the Yankee lead to 1 run heading into the ninth. With Rick Burleson on first and one out in the ninth, Remy hit a line drive towards Lou Piniella in right field who had trouble finding the ball in the sun. Only a lucky stab by Piniella held Remy to a single instead of a game tying extra base hit or even, according to Peter Gammons, an improbable game winning walk off inside the park home run. The Red Sox would leave both runners on and lose a heart-breaker to the Yankees. Remy would reflect on that moment as "close as he would get to being in the World Series." Coming off that dramatic loss in 1978 and an All-Star appearance, 1979 brought disappointment for Jerry Remy by way of a knee injury sustained sliding into home in a game against the New York Yankees. Remy would be limited to 80 games in '79 and his nagging knee injury would limit him to shortened seasons in both 1980 and '81 as well. Even with Jerry Remy's frustrating seasons, they weren't without highlights. In 1981, in a 19 inning game against the Seattle Mariners at Fenway Park, Remy would pick up an American League and Boston team record six singles going 6-10. This record would be tied by Nomar Garciaparra in 2003 with Remy calling the game on NESN. In 1982, Remy finished in the top ten in the American League in at bats, hits, and sacrifices. He would play well through pain through the 1984 season when his left knee caused him to retire. From the time of his injury on, Remy would have 10 separate knee operations to repair the damage in his knee. As a player the Rem Dawg will ever make the hall of Fame, at least the one in Cooperstown, but over his ten years he proved to be a solid contributor that was often underrated. In 1,154 games Remy collected 1,226 hits, scored 605 runs while driving in another 329, and maintained a .275 average. With contemporaries like Bobby Grich and Willie Randolph, Remy always seemed to be thought of as just as step behind. The truth is in some regards he was a step ahead, the only knock against him was his lack of power, but that was never his game. His game was to play solid defense, move runners along, and score runs, tasks he did as well as anyone. The downside was his injury precipitated an unplanned early retirement during spring training in 1986. The good side of the coin was that it opened a door for Remy. In 1988 he signed on as a sports analyst for NESN (New England Sports Network) which carries the Red Sox games. Initially he was part of a three man team which consisted of himself, Don Orsillo, and Ned Martin. Eventually Martin fell by the wayside and the dynamic between Remy and Orsillo was so good management knew better than to mess with a winning team. What that pairing has produced so far is 4 Emmy Awards, and a 2004 nod from Sports Illustrated as the favorite sports announcer in Massachusetts.